Knitted Iron Man Christmas Sweater | Nerd Much? The endless flow of nerdy Christmas things will soon begin, but for now, we’re peppering in some cool new things we’re already seeing pop up around the web. This year, it’s clear that Merchoid is in the holiday spirit early too, as they’ve added numerous new ugly Christmas sweaters to their catalog. If we had to pick a favorite of their newly added sweaters, it would have to be this Knitted Iron Man Christmas Sweater. The gold, red and white sweater fits within the holiday theme, and it’s designed after one of Iron Man’s armor suits. It has snowflakes and Christmas trees on the front as well, and it has a light blue arc reactor knit into the center. There’s also a ridiculous image of Iron Man flying on the front of the sweater. If you’re looking for a superhero sweater that’s super tacky for your holiday party this year, check it out — it’s available exclusively at Merchoid in various sizes ranging from XS-XXXL. If you’re full into the holiday spirit already, check out our list of this year’s Christmas movies on TV to never miss a showing of your favorite Christmas classic. 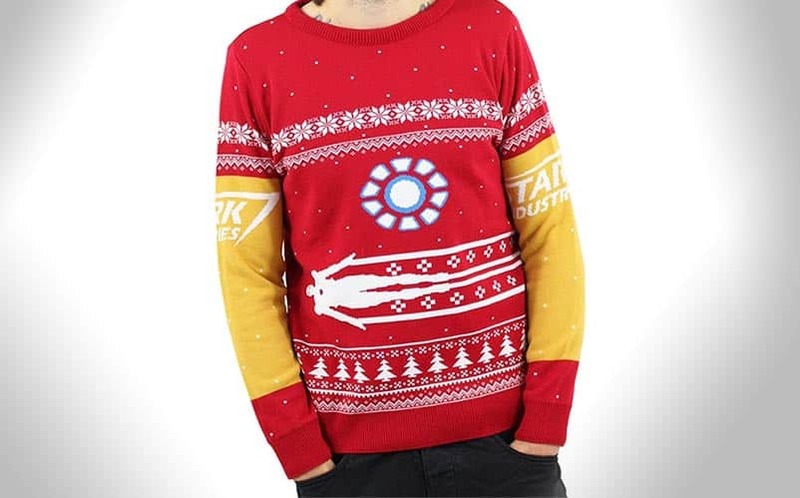 Buy the Iron Man Christmas Sweater here. For more nerdy Christmas stuff, stay tuned to Nerdmuch.com for the latest finds. You can also follow us on Twitter for timely updates.